Re: Yurt for backcountry skiing? A yurt might be a bit much for constant assembly and disassembly. If you can't put it together and leave it it will be alot of work each time you want to use it? 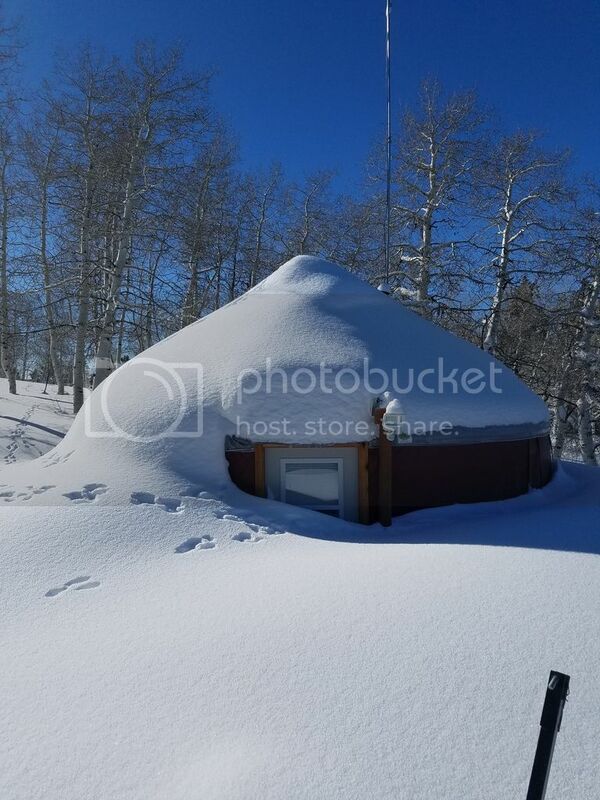 You need some substantial framing to leave a yurt up in snow county. Last edited by Stea; 01-26-2017 at 12:18 AM. in Missoula , Montana, so close to you. Yes the rafters are 2x6. Google them up and the site will give you the specs for the full wind and snow load kit. Love my yurt and they build a top notch yurt. I have a 16' yurt. For a family I suggest a 16'er for size at a minimum. I can get that in the 6'4" bed of my pickup, but the lath is 90" long when folded up, so rides diagonal. The whole yurt is probably 150 lbs. Not even kinda close to portable for hand haul. I want to park my truck immediately adjacent to the spot I erect the tent. As for erection time, that would be bout an hour from disassembled once you've done it a couple times, and that assumes go weather and not clearing snow, mud, etc. For a few days or longer, like a five day hunt camp, go for it, IF you can get the yurt to the site. However, for a much more portable camp, get a 12x14 wall tent like the outfitters use. Nowhere near as nice as a yurt, but a whole lot more portable, and faster to erect by far. You could get four in there but that is very tight. A small yurt in the 12' range is a lot more doable, but that is less room then a 10x12 wall tent. Three rafter wall tent frames, like for a 10x12 are 18 pieces of emt and nine fittings. WAAY less parts, shorter tubes, and a whole lot lighter frame and tent both. Have fun good luck. If you're thinking wall tent, call Davis Tent in Denver Colorado. Great tents at reasonable prices. Every guy I know with a wall tent, has a Davis wall tent. They are #1 around here, for a reason. Make the frame yourself. Cut EMT to the size they tell you, and buy fittings from MY TARP, like I did. Also, a portable hunting camp wood stove would be HIGHLY recommended for winter. Hot tent is THE way to go. Dry clothes, that alone is worth it. You can also brace a yurt in the winter to better cope with load. A few 4X4's will work wonders. I reread your initial post. A small treated canvas yurt or wall tent can be horse packed. Leaving it erected in the Rockies around Bozeman is something you need to consider. The 12' yurt will sleep 2 plus the stove. 3 plus stove in a 14'. 4 plus stove in a 16'er like mine. The entire frame is wood so if you stash it it needs to be painted. If you leave it erected uncovered, it needs to be painted VERY WELL with two coats of enamel prefered. If you remove the cover roll it in a plastic tarp such that water will not get in. Also you'd have critters to deal with. Here in town I don't have to deal with anything but mice rabbits fox dog cat etc. Never had a problem with them on the frame. My canvas and plastic tarps site perfectly protected in an old tool box. All the above storage is a guess. Haven't stashed anything in the montains except a wicker frame basket, and mice got into EVERYTHING. An emt frame and wall tent is the way to go imo. If you stash canvas on site it needs to be bone dry before rolled up in plastic tarp or it will mildew badly. That is an absolute certainty. Air dry is GOOD for canvas. Rolled and even slightly wet is not. out would be best for tent storage. Getting that up there is another thing. A dry attic that mice can't enter is the perfect place to store a canvas tent. i have read some outfitters stash emt wall tent frames, or their wood tent poles, and set up/tear down for seasonal use. So much work goes into making a yurt frame I wouldn't stash it in the woods, but that is jmo. Based on having my little 16' lightweight camping yurt up continuously since 6-2013, there is NO way I would leave it up through the winter here in the high Rockies for fear of snow collapse. If the cover was off and carfully stashed, I would. That's also assuming no two legged vermin were likely to see it. Long post but there you go.